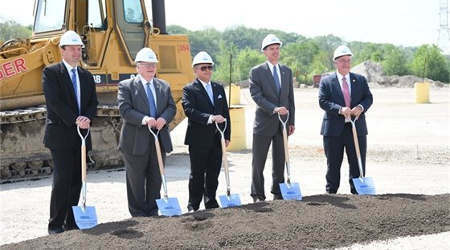 Metra Executive Director and CEO Don Orseno (at far right) joined local officials for the groundbreaking ceremony. Metra yesterday broke ground on a new Heritage Corridor Line station in Romeoville, Ill. The station will be the first new stop on the line since Metra’s creation in 1984, officials from the railroad said in a press release. The project is expected to cost $4.9 million, with more than $3.9 million covered by Illinois’ Congestion Mitigation and Air Quality Improvement grant program. Construction is slated to wrap up in fall. Metra’s Heritage Corridor Line runs between Chicago Union Station and Joliet, Ill.